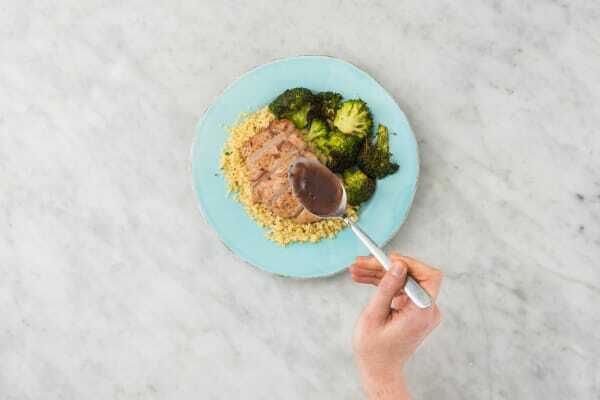 Part sweet, part tangy, and all-around delicious—that’s the thick and super-flavorful cherry balsamic glaze that’s drizzled over these pork chops. It’s got just the right balance of flavors, bringing some fruit-forward sophistication and an irresistible sweetness. Because it’s such a show-stealer, we’ve kept the sides simple with broccoli and buttered couscous so the meat and sauce can shine. And boy, do they steal the show. Produced in a facility that processes milk, eggs, fish, shellfish, tree nuts, peanuts, wheat, and soybean. 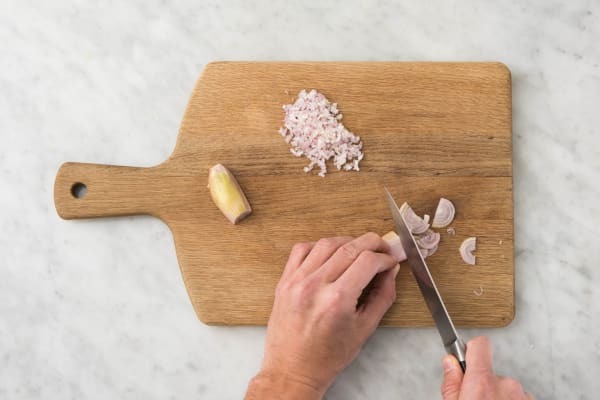 Due to the different suppliers we purchase our products from, nutritional facts per meal can vary from the website to what is received in the delivered box, depending on your region. Adjust rack to upper position and preheat oven to 450 degrees. Wash and dry all produce. Halve and peel shallots. Finely mince one and thinly slice the other. Melt half the garlic herb butter in a medium pot over medium-high heat. Add minced shallot. Cook, stirring, until just softened, 2-3 minutes. 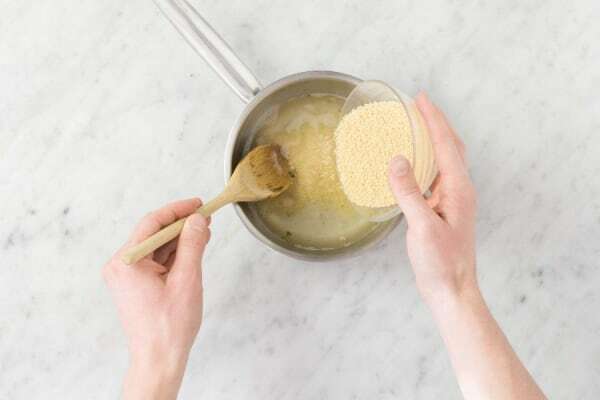 Stir in 1 cup water, half the stock concentrate, and a pinch of salt. Bring to a boil. Add couscous, remove from heat, and cover. Keep covered until ready to serve. 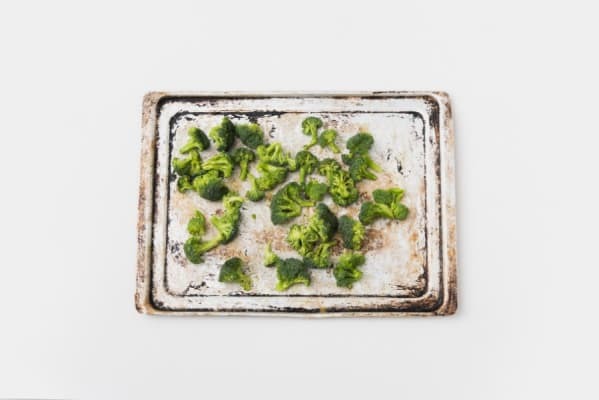 Toss broccoli on a baking sheet with a drizzle of oil and a pinch of salt and pepper. Roast under browned and tender, 10-15 minutes. Pat pork dry with paper towels; season all over with salt and pepper. Heat a drizzle of oil in a large pan over medium-high heat. Add pork and cook until browned and cooked to desired doneness, 4-6 minutes per side. Turn off heat; remove from pan and set aside, covered. Heat another drizzle of oil in same pan used to cook pork over medium heat. Add sliced shallot and cook, stirring, until lightly browned, 4-5 minutes. Pour in vinegar and let simmer until slightly reduced, about 1 minute. 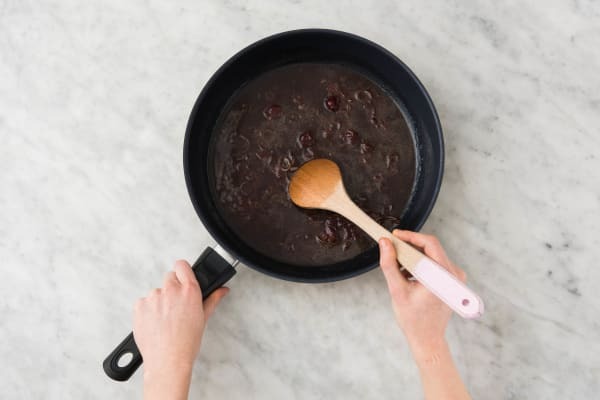 Stir in jam, ½ cup water, and remaining stock concentrate. Simmer until thickened, 3-5 minutes. Season with salt, pepper, and ¼ tsp sugar (to taste). Turn off heat. Add 1 TBSP plain butter and stir until melted. 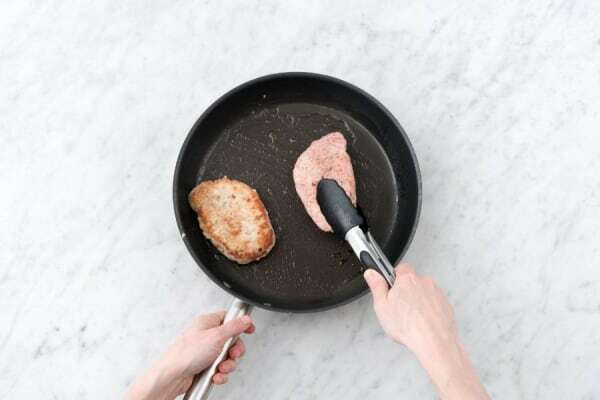 Return pork to pan; flip to coat in sauce. Fluff couscous with a fork; stir in remaining garlic herb butter. 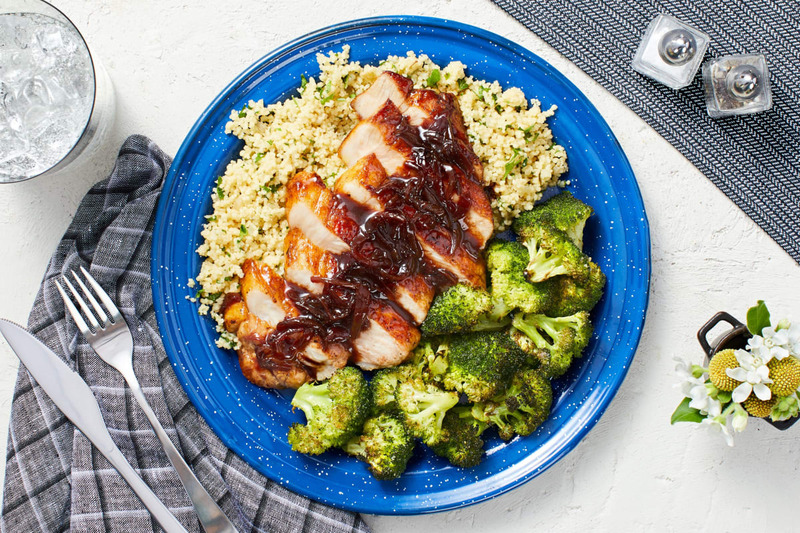 Divide couscous, broccoli, and pork between plates. Top pork with any remaining sauce.